New York is looking particularly grey today after a weekend in sunny Miami, but actually I’m glad to be back. Whilst it was fantastic to have the chance to go, and I did enjoy the beautiful weather, I have to say I found Miami to be quite a strange place, though I’m not entirely sure I can explain why. 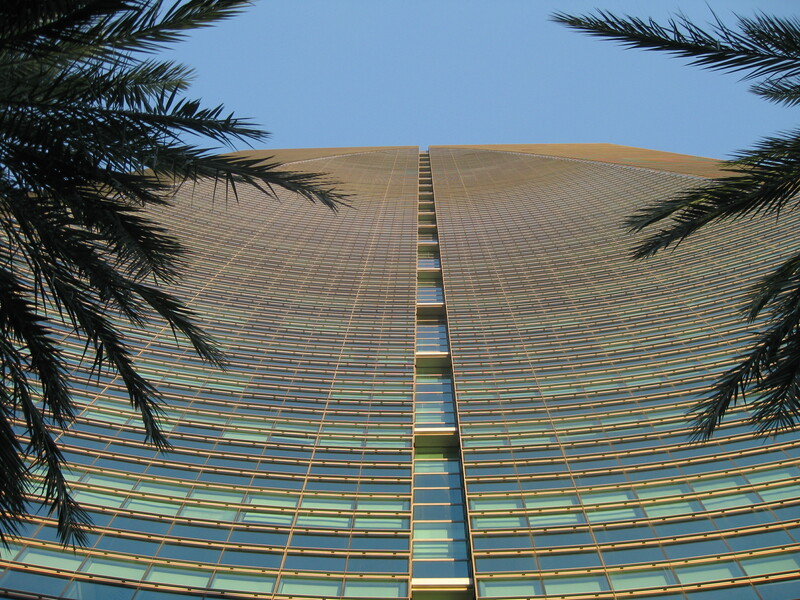 The hotel itself was fantastic, and we had great views from our 21st floor room (which also happened to be larger than our Manhattan apartment). 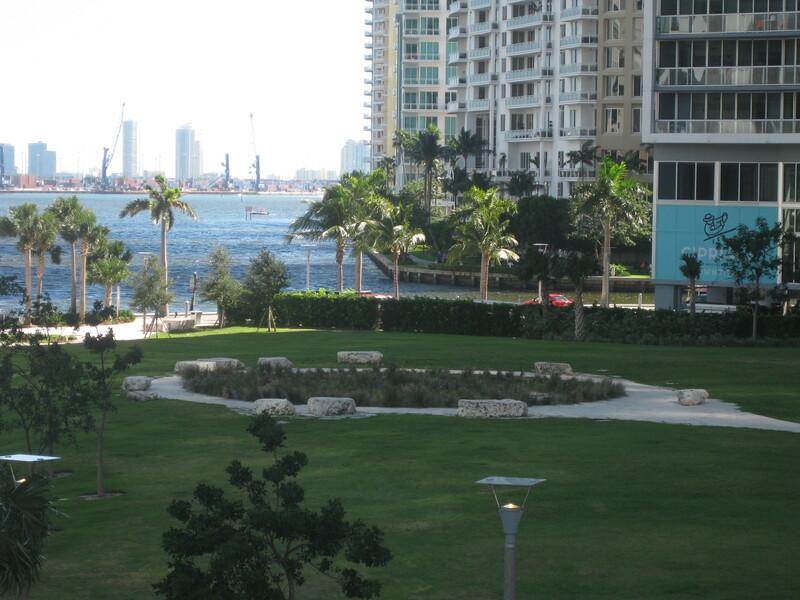 It was located a little bit south of downtown Miami, just across the Miami river on Brickell Avenue. 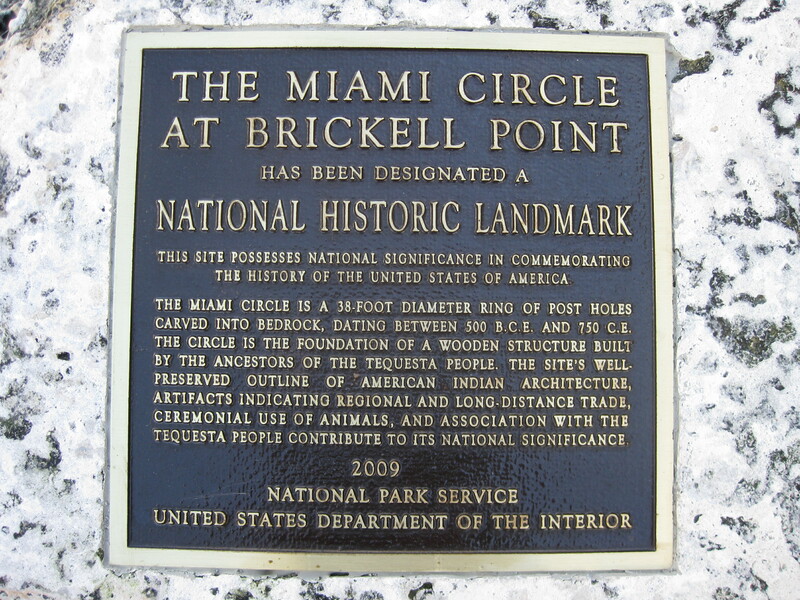 This is apparently one of the longest-settled areas of the city, and quite by chance I stumbled upon one of America’s few prehistoric monuments just a few minutes walk away – the Miami circle. Nowadays this part of town is all tall office buildings and apartments, and, other than the vultures circling overhead (yes, really! ), it felt just like being back in Canary Wharf. Compared with New York (and, indeed, with London) it was all very shiny and clean, with a surprising amount of greenery everywhere, and extremely quiet (which I found most disconcerting). Public transport in Miami seemed really good, with a free elevated monorail loop around the downtown area and buses and trains serving more distant parts of the city. The Brickell area also had a small old-fashioned-looking trolley bus, and both this and the normal buses had a pull-down cycle rack on the front. 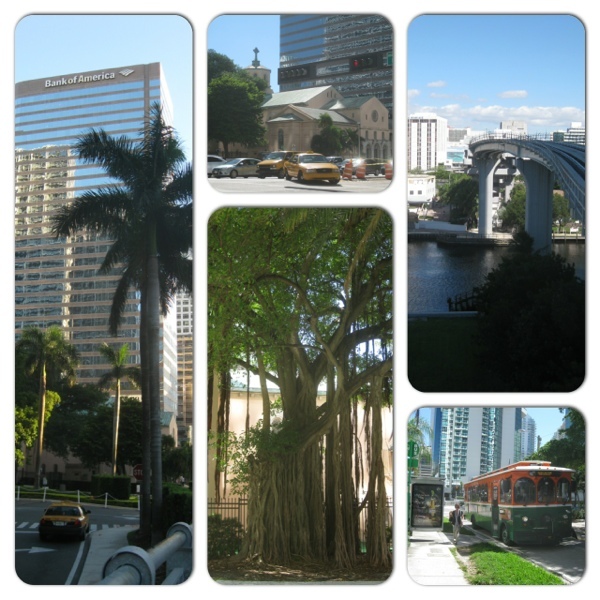 I spent quite a bit of time riding around the monorail, and we took the bus over to Miami Beach as well. 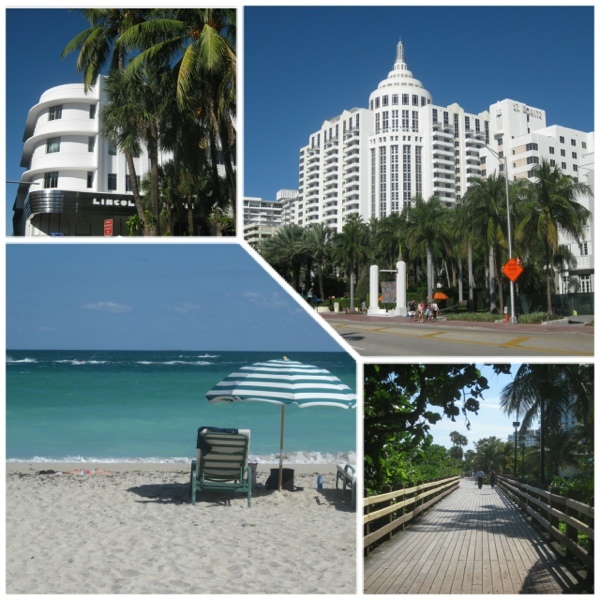 Miami Beach is completely different to downtown, and I suspect is what most people think of when bringing Miami to mind. It’s actually on an island, connected by several causeways to the mainland – historically it was a sandbar with mangroves and was expanded using landfill from dredging the bay. It has been a holiday resort since the 1920s, and many beautiful art deco buildings survive from this time. It does feel rather like wandering around a film set, especially when combined with the stereotypically lovely beach and boardwalk. Back on the mainland, it was interesting to see how the architecture changed from new high-rise buildings along the coast to smaller one or two storey homes nestling amongst the trees further inland. It shows how accustomed I’ve become to wanting to find the old city centre when I visit somewhere, because it really bothered me that I had no idea where that might be in Miami, and although I did spot one or two historic-looking buildings I left with the impression that I’d missed something. It also didn’t help that I wanted to visit a museum or two on Monday, which is the day that they’re closed. As well as a lot of walking, I enjoyed a swim in the hotel’s outdoor pool (on the roof of the carpark, which we thought was quite ingenious), and went running twice (and despite the heat and humidity I managed my first non-stop 5km, which I’m ridiculously pleased about). Naturally plenty of tasty food and a cocktail or two were consumed, as well as the required holiday quota of ice cream. And, of course, every trip needs to end with some souvenirs. 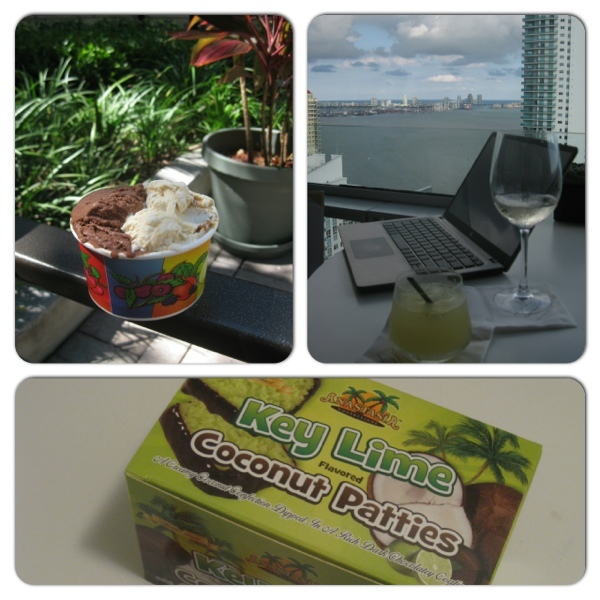 This entry was posted in Travel and tagged Miami, Miami Beach, Miami Circle, weekends away by Emma Davidson. Bookmark the permalink.